Our surveys showed that only two percent of polymer artists are men. That statistic may have contributed to the popularity of Dan Cormier and Staedtler’s director of marketing Nils Henssen during the Synergy3 auction. Saskia Veltenaar and Marjon Donker, publishers of the Polymer To Art Magazine started the silliness by requesting Dan’s kissable stubble as an auction item (a bold move considering that Tracy Holmes was the auctioneer). When Saskia and Marjon later proposed Nils as an item, Hollie Mion and I could not let the Europeans outbid us. Here’s Nan Roche dropping out. To raise the stakes, I offered a PCD post that would document the event. I’m paying up with this post. Here are the two kisses that raised hundreds of dollars for IPCA. It was hard to explain to my husband how I placed a winning auction bid and came home with nothing. Silliness aside, the Netherland’s Saskia and Marjon are offering a copy of this month’s issue of their international magazine, the Wind issue, to FIVE lucky winners who leave a comment on this post. Sign up before Tuesday midnight to be entered to win. Winners will be announced Wednesday. Being a descendant of Netherlanders who is still dabbling with clay between jobs, I would love to read this magazine. I just had a late lunch with Linda Braunstein-Gilcher, who attended Synergy this year (along with her store), and got the scoop. It sounds fascinating, but is probably a venue far above my skill level. Still, I look forward to reading about it from various sources, perhaps learning something I can use in my own art. I’d love a copy of the magazine. Thanks for the chance to win! Am trying to improve my skills with polymer, so would love to win a copy of this book. I would love to receive a copy of this issue! I would love to have the Wind Issue of Polymer to Art. I am always looking for new sources of inspiration. 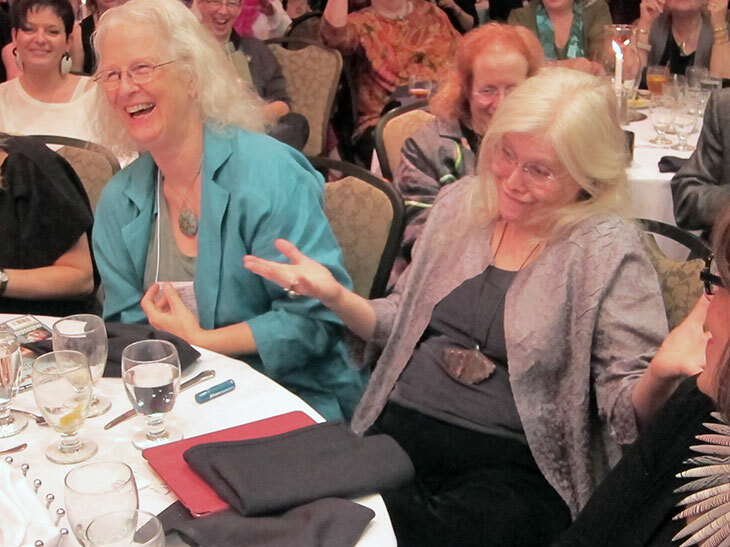 Oh, and the pictures tell it all… What a fun time at Synergy3! Thanks so much to Netherland’s Saskia and Marjon for offering a copy of this month’s issue of their international magazine. I couldn’t go to Synergy, but it is nice to see all the pictures everyone has shared. I can’t get enough of polymer, I am addicted! Congrats on the winning bid..but I think the other 4 got the better end of the deal…. Thanks to Saskia and Marjon for the giveaway. As a relatively new clayer, I am always looking for information, inspiration and instruction. Your magazine sounds like a breath of fresh air. I would be looking forward to it. With cheeks and smiles like those how could you resist? I have been wanting to see a copy of From Polymer to Art since they started publishing it. Maybe this will be my chance! would love to win this magazine, I’m working on making my beads masterpieces! One day I’ll get there! I’ll throw my hat into the ring! This reminds me of the situation at the faculty of mathematics and physics, only there we were 3 girls and 374 boys. Lol. You are being creative in all areas of life. Never seen this magazine but have only heard amazing reviews. Would love to see what all the talk is about! Looks like it was a lot of fun, wish I had been there to bid!! I am so excited about learning some new techniques and being inspired! I am always looking for new polymer clay material to read … Would be wonderful to check out the magazine. Heard good things about it! Why not? It’s the next best thing to a kiss! I thoroughly enjoyed the auction and all the silliness involved. I’d love to win an electronic copy of the magazine. 2% 😉 Oh well, maybe I will get lucky. You came home with such a fun memory and the photos to prove it. And I would love a copy of From Polymer to Art. love reading the regular articles. I was unable to attend this years Synergy, but seeing these pictures just strenghtens my determination to make it to the next one! Two years to save up! And to learn there is another polymer magazine! How exciting, I would love to check it out. Thanks to Saskia and Marjon, and Cynthia for this giveaway! Life would be boring if polymer had not entered my life, please throw my name in the hat! So sorry to have missed the Synergy conference. Thanks for posting your presentations, Cynthia. Also, thanks for a chance to win this magazine! Great way to raise money! I think we all appreciate men who in turn appreciate art and the beauty and inspiration it adds to our lives! I would love to see the European Angle on Polymer Clay. I have been very inspired by many European Clay artists. One of the many benefits of being able to surf the web internationally. the whole kissing auction was a super cute idea!! I don’t think that either of the guys look like they minded being part of the auction! Such Fun! Thank you all for your comments, your enthusiasm, your lovely words! This auction evening was unforgetable (special thanks to our two hunks of clay)! What can we say… Kisses from Holland! Haha! Looks like you had a fun time!! The synergy auction is always a little crazy, but this year those FROM POLYMER TO ART girls really took it over the top! Thanks for the laughs and great memories. Hi, just found your site and would love to try your magazine. I hope to get one.